Maps in SunPy are are 2-dimensional data associated with a coordinate system. In this guide, we will cover some of the basic functionality of maps. Once you’ve read through this guide check out SunPy map for a more thorough look at SunPy maps. There you can see what instruments are currently supported or you can access the code reference for each instrument-specific map subclass. SunPy should automatically detects the type of file (e.g. FITS), what instrument it is associated with (e.g. AIA, EIT, LASCO) and will automatically look in the appropriate places for the FITS keywords it needs to interpret the coordinate system. If the type of FITS file is not recognized then SunPy will try some default FITS keywords and return a GenericMap but results may vary. 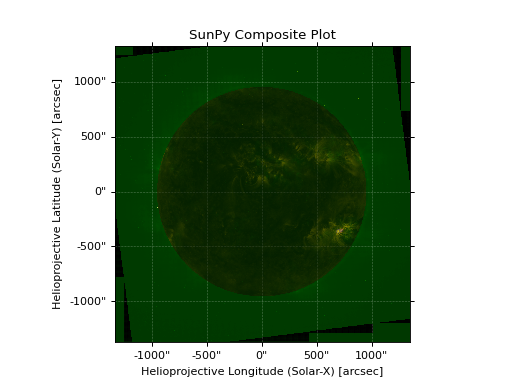 SunPy can also create maps from the jpg2000 files from helioviewer.org. The keys in the header follows the FITS standard. Many attributes and functions of the map classes accept and return Quantity or SkyCoord objects, please refer to Units and Coordinates in SunPy for more details. One important fact to remember is that the first index is for the y direction while the second index is for the x direction. For more information about indexing please refer to the Numpy documentation. Here the dimensions attribute is similar to the shape attribute, however returning an Quantity. Python makes use of pointers so if you want to alter the data and keep the original data in the map intact make sure to copy it. This will open a matplotlib plot on your screen. In addition, to enable users to modify the plot it is possible to grab the matplotlib axes object by using the plot() command. 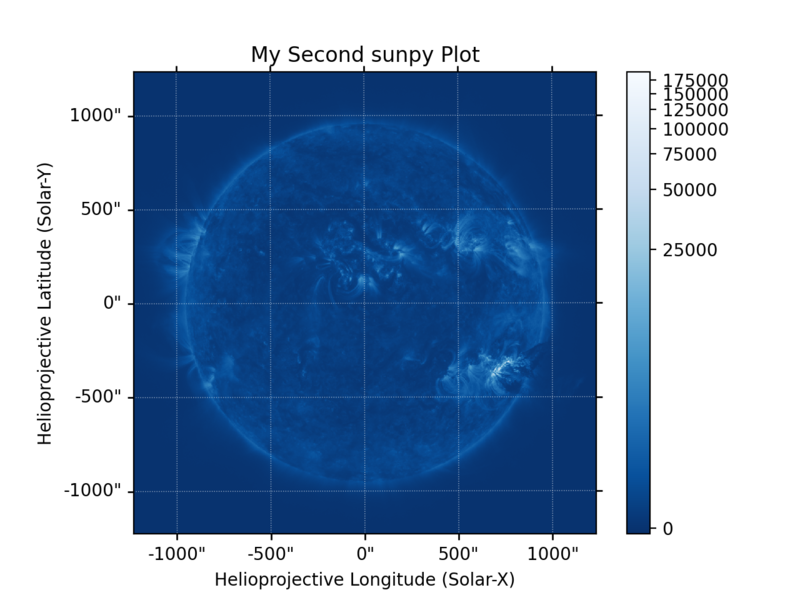 This makes it possible to use the SunPy plot as the foundation for a more complicated figure. For a bit more information about this and some examples see Plotting in SunPy. If the astropy.visualization.wcsaxes package is not used (it is used by default) the plot() and peek() methods assume that the data is not rotated, i.e. the solar y axis is oriented with the columns of the array. If this condition is not met (in the metadata), when the map is plotted a warning will be issued. You can create an oriented map by using rotate() before you plot the Map. For Map imshow does most of the heavy lifting in the background while SunPy makes a number of choices for you so that you don’t have to (e.g. colortable, plot title). Changing these defaults is made possible through two simple interfaces. You can pass any imshow keyword into the plot command to override the defaults for that particular plot. The following plot changes the default AIA color table to use an inverse Grey color table. You can view or make changes to the default settings through the plot_settings dictionary. In the following example we change the title of the plot by changing the plot_settings property. 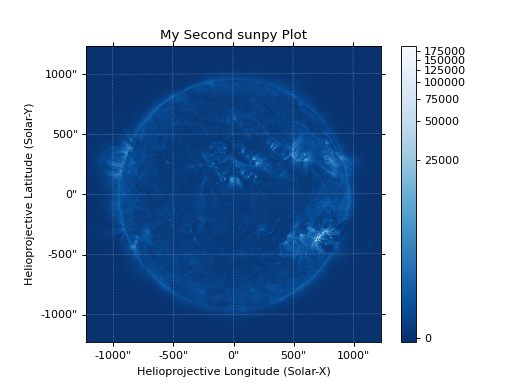 smap.plot_settings['title'] = "My Second SunPy Plot"
Image data is generally shown in false color in order to better identify it or to better visualize structures in the image. 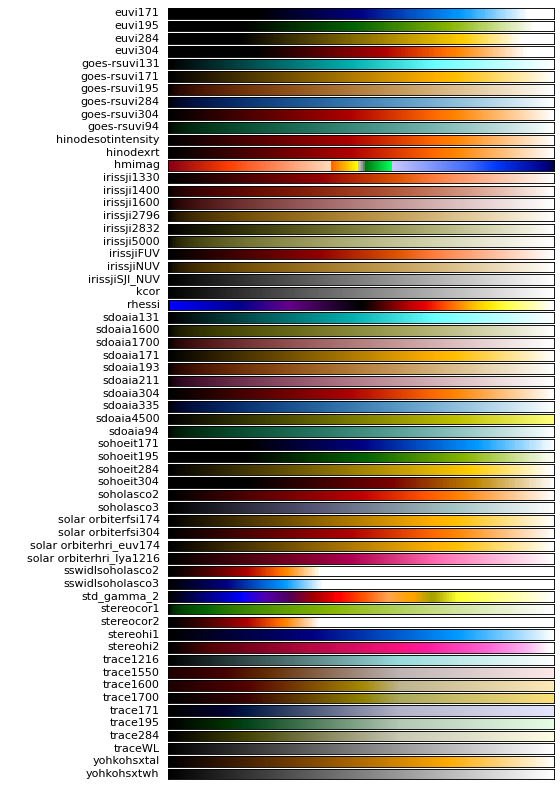 Matplotlib handles this colormapping process through the colors module. This process involves two steps: the data array is first mapped onto the range 0-1 using an instance of Normalize or a subclass; then this number is mapped to a color using an instance of a subclass of a colormap. 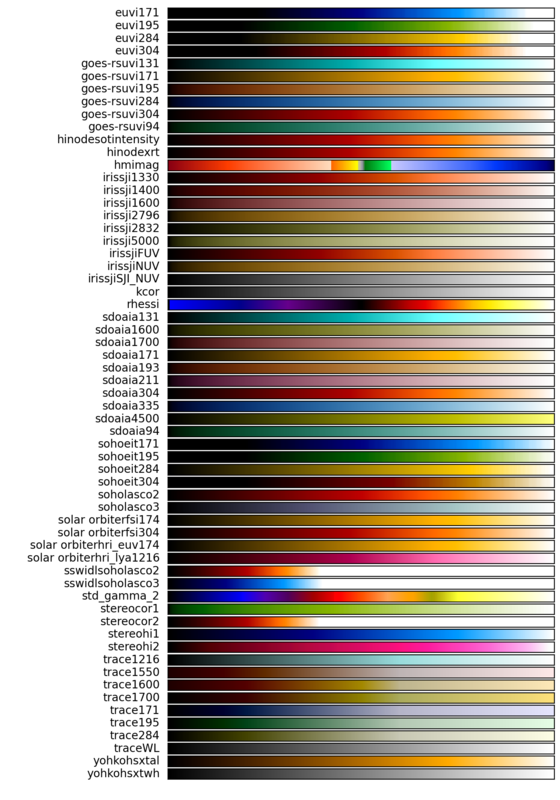 The following plot shows off all of the colormaps. These can be used with the standard commands to change the colormap. So for example if you wanted to plot an AIA image but use an EIT colormap, you would do so as follows. The normalization is also set automatically and is chosen so that all the data from minimum to maximum is displayed as best as possible for most cases. This means that it is never necessary to touch the data such as applying a function such sqrt or log to the data to make your plot look good. There are many normalizations available from matplotlib such as Lognorm. Other more exotic normalizations are also made available from Astropy. Just like the colormap the default normalization can be changed through the plot_settings dictionary or directly for the individual plot by passing a keyword argument. The following example shows the difference between a linear and logarithmic normalization on an AIA image. Note how the color in the colorbar does not change since these two maps share the same colormap while the data values associated with each color do because the normalization is different. Here is an example of this put to use on an AIA image. If you see how the image displays by default you’ll see that it does not look that pretty. This is because the image contains some negative values which are throwing off the normalization. In order to fix this we need to adjust our normalization to not display negative values. We can also brighten the image by clipping the high values though this will mean that the bright regions look ‘saturated’. This is achieved in the following plot. Another method to ignore bad data is to mask the data. A mask is a boolean array and so can give you much more fine-grained control over what is not being displayed. A MaskedArray is a subclass of a numpy array so it has all of the same properties with the addition of an associated boolean array which holds the mask. The following code adds a new map (which must be instantiated first), sets its transparency to 25%, turns on contours from 50% to 90% for the second map, and then plots the result. Note that an array is returned only if all the maps have the same shape. If this is not true, an error (ValueError) is returned. If all the maps have nx pixels in the x-direction, and ny pixels in the y-direction, and there are n maps in the mapcube, the ndarray array that is returned has shape (ny, nx, n). The data of the first map in the MapCube appears in the ndarray in position [:, :, 0], the data of second map in position [:, :, 1], and so on. The order of maps in the MapCube is reproduced in the returned ndarray. This returns a list of map meta objects that have the same order as the maps in the MapCube. A typical data preparation step when dealing with time series of images is to coalign images taken at different times so that features in different images remain in the same place. A common approach to this problem is to take a representative template that contains the features you are interested in, and match that to your images. The location of the best match tells you where the template is in your image. The images are then shifted to the location of the best match. This aligns your images to the position of the features in your representative template. for a full list of options and functionality. This is the function used to calculate the shifts in MapCube coalignment function above. Please see calculate_match_template_shift to learn more about its features. Shifts calculated using calculate_match_template_shift can be passed directly to the coalignment function. Often a set of solar image data consists of fixing the pointing of a field of view for some time and observing. Features on the Sun will rotate according to the Sun’s rotation. A typical data preparation step when dealing with time series of these types of images is to shift the images so that features do not appear to move across the field of view. This requires taking in to account the rotation of the Sun. The Sun rotates differentially, depending on latitude, with features at the equator moving faster than features at the poles. SunPy provides a function to shift images in MapCube following solar rotation. This function shifts an image according to the solar differential rotation calculated at the latitude of the center of the field of view. The image is not differentially rotated. This function is useful for de-rotating images when the effects of differential rotation in the MapCube can be ignored (for example, if the spatial extent of the image is small, or when the duration of the MapCube is small; deciding on what ‘small’ means depends on your application). For more info see mapcube_solar_derotate. Please consult the docstring of the mapcube_coalign_by_match_template function in order to learn about the features of this function.